Many years ago, I made the acquaintance of Pete Brown who, I discovered after some time, was the author of a book called ‘Smallcreep’s Day’ published over 50 years ago in 1965. It was the story of a man who works in a factory. And every day of his long existence he has been stuck in one place making one particular component for some unknown machinery. One day he decides he wants to actually know what is the final product he’s to which he’s been contributing all these years. So he sets out on a journey into the depths of the factory to find out – a journey which becomes surreal and awful in equal measure. It must have been one of the earliest reflections in popular culture of something that has become a widely understood truth. We seek meaning in what we do, and achieve much greater satisfaction if we find it. For me at the time – well before I’d discovered the world of work for myself – it was an early influence that whatever I did needed to have a wider purpose. And that was long before it had become a buzzword in management circles, or even counted as a relevant factor at all. But we’re now in a significantly changed world – and many people that are coming into the workforce say that they want satisfying, meaningful, work. It’s rather what the millennial generation – rightly or wrongly – has become famous for. But largely they remain as unfulfilled as Smallcreep himself. The most recent Gallup global survey found that only 13% of workers worldwide are engaged in their work, committed to their jobs and making a positive contribution. So what have we learned in the intervening decades about what makes for meaningful, engaging work? How hard would it be to make it the norm, rather than the exception? Here are a few things. You can probably think of others. Sufficient challenge and complexity. Many of the jobs such as those carried out by the Smallcreep character that involved the pulling of a lever, over and over again – those jobs have been automated. But mindless work still exists. It may be more efficient to have different workers doing one action over and over, but you get more satisfied and motivated workers if they do a more complex range of actions to create something significant. It was the movement for quality that created so many awful dreary jobs. Because it was intuitively easier to reduce defects if you got people to do one thing, before passing it on to the next person. 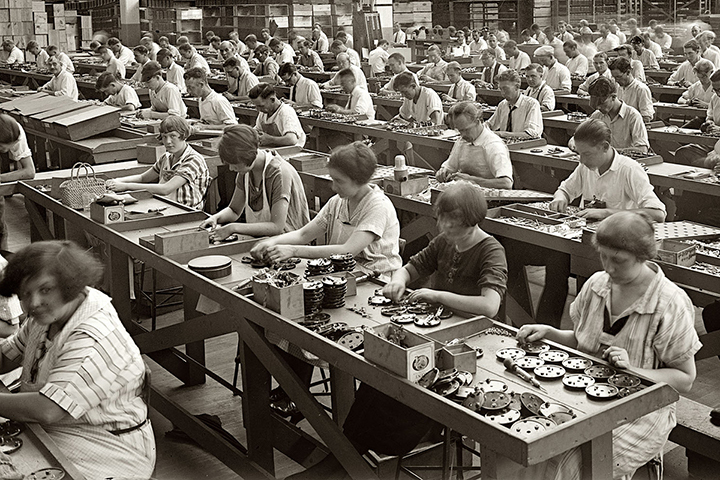 The other way to reduce defects – to make people into skilled craftsmen who take a pride in their work – that was considered to be less efficient. Increasingly, we’re seeing that assumption to have been a mistake on anything but the purely mechanistic level. Growing skill and capacity over time. We always want to feel like we’re making progress. If we have a craft and we know that we’re getting better and better over time, then it gives a sense of momentum and mastery. Interestingly, there may be some evidence that we’re kidding ourselves. Psychologist and author K. Anders Ericsson suggests that once people in most professions reach “acceptable performance and automaticity” they don’t improve further regardless of how many years they practice. Indeed, it can actually go the other way. The key to getting better is to engage in proper ‘deliberate practice’ – pushing yourself to do things that are currently outside your comfort zone. Employers – for all that they will push you to do things faster – generally don’t give you work specifically to challenge and develop you. But if they did, the evidence suggests they would see real benefits. The power to make decisions. If you know the mission and the intended end goal, then you’re empowered to make decisions along the way to help achieve that goal. If your job is the equivalent of ‘pull that lever’ then even if it turns out to be the wrong thing to do, you’ll keep doing it because you have no permission to take the initiative. Good bosses have often found value in “going to the shop floor” to talk to people about how things really are. Because those are the people that see the things that go to waste, the things that aren’t working, the stages where mistakes are made. The best bosses give people the autonomy to fix the problems when they see them. And to want to do so because they feel like they own the process and the outcome. Recognition and reward. It is most satisfying when you see a direct link between the amount of effort you put in, and the amount of recognition and reward that comes your way as a result. It’s a delicate thing. Praise when you know it’s not been earned can be as demotivating as the absence of recognition when you’ve made a real difference. And the ultimate killer is when you have ‘free riders’ – people that add to your burden because they don’t pull their weight and yet they share in the credit regardless. Being part of a wider social purpose. Just about any product or service, if it helps real people to solve real problems, can be described in terms of the positive difference it makes to the world. And nothing is more motivating than if the achievement of that social purpose is an explicit part of the process. On that last one, ‘maverick’ boss Ricardo Semler was once asked how you could identify such purpose for some of the humblest of service workers – such as school dinner ladies. But you don’t get more important than that, he protested. These people have in their hands the health and wellbeing of some of the great people of tomorrow. And, he might have added, good nutrition has been shown to assist in how well young people are educated. Smallcreep would surely have settled for that.